When your customers are leaving you, it's hard not to notice. Between falling NPS scores, an increased volume of customer complaints, and an uptick in cancellations, active customer churn demands your attention. It makes you listen and fight. Yet, it can blind you to an equally deadly problem lurking within your business. Involuntary churn creeps into your subscription business silently. It goes to work in the background, stripping away your subscribers, revenue, and growth. Though quiet, involuntary churn isn't inevitable. As long as you recognize the hallmarks and put the right processes in place to handle it, you can dispatch the threat without much work. Don't let high churn eat away at your customer base. Voluntary churn is a conscious choice by a customer to leave your service, while involuntary occurs when a customer does not intend to leave. Involuntary churn often goes unnoticed and is often caused by forgetting to update payment information, credit card limits, or server errors. Growth relies on sound unit economics. Specifically, you're looking to achieve a 3:1 ratio between the lifetime value (LTV) of each customer and their customer acquisition costs (CAC). Involuntary churn has a calamitous effect on this ratio. Let's say that your average customer lifetime is 18 months and your average MRR per account of $100. With an LTV of $1,800, you can get away with a maximum CAC of $600 to maintain that healthy 3:1 ratio. Your product is a smash hit and you're sitting pretty with zero active churn. Yet, your quick growth masks a threat that lurks in the background. Involuntary churn doesn't strike immediately. Credit cards expire about every 3 years, so in the 18-month lifecycle of your customers, about half will need to update their payment info or you'll lose them to involuntary churn. You'll see involuntary churn as a slow erosion on your growth over time rather than a downward spike. It quickly adds up. At 18 months, you've lost almost a half a million dollars in revenue. Increase your prices in an attempt to increase the numerator in the LTV equation. Decrease CAC to reduce the amount you are spending on each customer. Neither option is palatable (or always possible). Both your pricing and your CAC should be dictated by the nature of your customers, not your churn. Yet, unchecked involuntary churn won't stop after killing your unit economics. It will kill your customer experience too. Beyond the hit to your revenue, involuntary churn can destroy the trust your customers have in you and your product. Let's imagine you're a marketing automation service. On the day one of your customer's payments comes due, an automated charge fails due to an expired card. With no process in place to alert your customer of their payment failure, they're locked out of their account. Unbeknownst to them, your tool has stopped working. Prospects in workflows stop receiving communications; ad placements are turned off; landing pages stop storing customer information. When they discover the issue, they make an irate call to your customer support team and provide a new payment method. They're back in their account, but the damage has been done. This scenario has played out again and again at SaaS companies that don't actively manage their involuntary churn. If your customers can't trust you to consistently provide a service (even if its their payment method that fails), they'll quickly find someone else who can. When failed payments have terrible consequences, you turn customers who involuntarily churn into customers who actively cancel. Involuntary churn isn't restricted to your least engaged customers; it affects all of them. When juggling everything required to run a successful business, credit card expiration dates or fraud holds are not top of mind. Your highest-value, happiest customer can be just as forgetful as your lowest-value one. 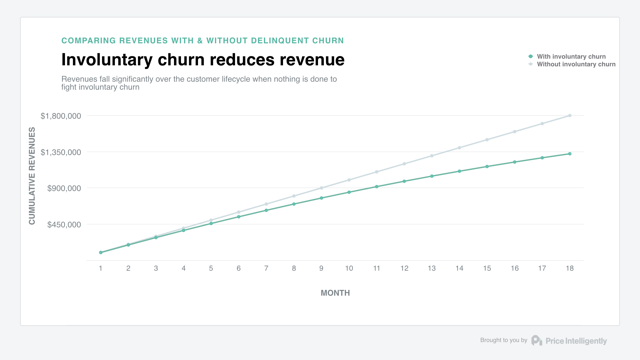 Involuntary churn doesn't discriminate by customer size or plan. It targets every customer you have and hits you right in the revenue. Involuntary churn stays silent because your billing is silent. Most businesses set up their billing system and expect everything to go smoothly. But like any service, billing systems and credit cards don't work perfectly. All types of problems can arise, particularly if you are dealing with a large volume of transactions. Credit card expirations are the largest contributor to involuntary churn. Anti-fraud laws mandate that cards expire every three years, meaning around one in three customers need to update their card number, expiration date, and CVV in your billing system within the next year. As we discussed above, the longer your customer lifetime, the more involuntary churn you'll face. In 2016, $16 billion was stolen from 15.4 million Americans. With the frequency and size of recent data breaches (Equifax is not alone here), the chances that your customers' credit card information has been stolen is high. Credit card declines after a card has been reported stolen will become more common-place. False-positives are also a frequent occurrence, as credit card issuers and banks take a better safe than sorry approach to legitimate automated payments. SaaS companies aren't immune to maxing out their credit limit on a particular card. In fact, they're particularly vulnerable. As SaaS companies grow, they add new tools to the stack and pay more for tools they're heavily using. If someone isn't carefully watching each card, soft payment declines can turn into hard declines if your customer doesn't pay their bill. Companies, especially growing ones, change offices frequently. As the team outgrows a space, it's easy to forget to update credit card info in the chaos of a move. If your customer updates their credit card information with their issuer but not with you, it will only take a month or two before their payment is declined. If you don't flag a payment as recurring in your billing system, an issuer will believe that there's is an error causing constant billing every month. Like with fraud, issuers err on the side of caution and may choose not to process a payment for a month to see if their customer complains. These delinquencies quickly add up: involuntary churn makes up between 20-40% of your overall churn. Here's what you can do to get a handle on your involuntary churn before you start losing revenue. For a silent assassin, involuntary churn is relatively easy to kill. Unlike voluntary churn, you don't need to make any changes to your product or business model. Solving involuntary churn is all about keeping customers who don't want to leave from leaving. All companies know when their customers' credit cards will expire, but few take proactive steps to alert their customers and collect current information. Setting up a series of messages inside your app to remind customers to enter new credit card information is the best way to provide a fruitlessness update experience and decrease failure rates (which also reduces churn rate). In-app notifications target your customers while they're actively receiving value from your product, so they'll be primed to pay to continue that service. Proactively sending notifications before a payment fails prevents a break in service that can be devastating to customer trust. Sometimes, it's not possible to catch a payment failure before it happens. In these cases, you'll want to send a series of emails to your customer that alerts them to the issue and provides a direct link to a page where they can enter new info. With Retain, we've iterated through thousands of email variations to develop an email cadence that successfully recovers most delinquent customers. It's rarely a good idea to lock customers out of your app as soon as a payment fails. Instead, notify them of the issue with in-app messages and emails and specify a grace period where they can continue to use your product while they straighten things out. This grace period can make the difference between a negative customer experience and a positive one. If the grace period has elapsed, retain all of their information but prevent them from using your app until they enter new information. This will typically compel a regular user to pay if they haven't already. Most companies (and billing systems) rely on dunning emails alone to recover customers who have involuntarily churned. These recover some existing customers, but are easily ignored. We've found that using these strategies together dramatically boosts recovery rates. 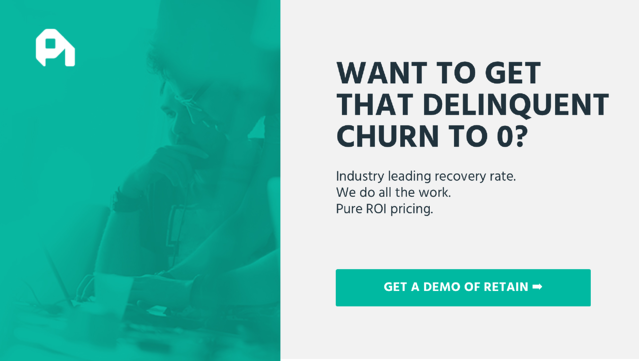 If you're interested in learning how we've reduced churn automated the recovery of 7 out of 10 involuntarily churned customers, we're happy to chat. In both its active and involuntary forms, high churn is a serious threat to subscription businesses. Involuntary churn is the call coming from inside the house, easy to miss until it's too late. Through the strategic pairing of proven recovery techniques, you can dramatically boost your recovery rates while providing a better experience for your customers. By tackling involuntary churn alongside active churn, you can stop the silent killer inside your business in its tracks.